EPDM & Modified Bitumen Torch Down Rubber Roofs - Which is the Best? We took pictures of EPDM and Modified Bitumen Rubber Roofs that are about 10 years old to show a comparison of which roof lasts longest with the least amount of maintenance. We repair and install flat roofs Pittsburgh, Stamford, White Plains, and Norwalk. Above is a Modified Bitumen Torch down roof that is 14 years old. This EPDM roof is 10 years old. It has had many seam repairs. 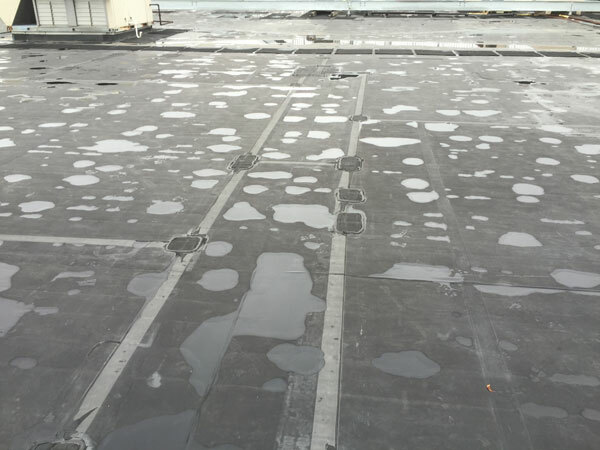 Patches on the EPDM rubber roof above show areas of degradation. This roof did not last more than 5 years. We took several pictures of EPDM roofs we repaired with Modified Bitumen. In the image below you will notice that around every patch is a caulking called lap sealer. The patches on an EPDM roof are not what secure the area from leaking, rather, its the caulking around it. All EPDM roofs have seam problems regardless of how well it was installed. 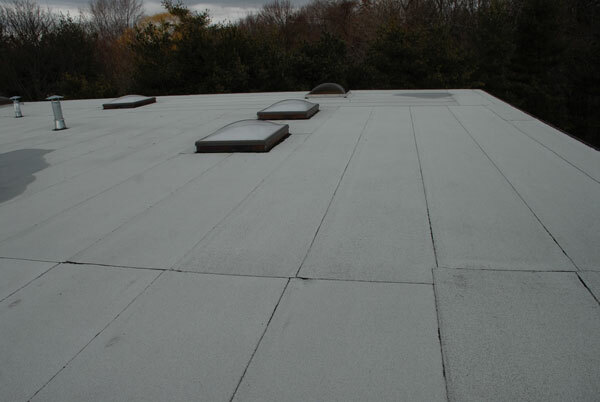 The adhesives fail because they cannot withstand the surface heat which can reach upwards of 160° F.
Above is another roof with many patches. Notice the old sealant in the darker color and then a newer sealant, used at a later time, is the lighter color. The Modified Bitumen Torch down roof below was installed by us over 14 years ago. This roof looks as good as it did the day it was installed. Just look at the age of the roofs and notice what type of repairs have been done. On EPDM roofs you will always notice patches everywhere. This roof was installed by us over fourteen years ago and has never needed a repair. There are 2 roofs in this picture. One is coated and the other one not. Both are over 15 years old and have never been repaired. The image below shows a Modified Bitumen roof with debris scattered around. If this was an EPDM roof, it would have been destroyed by now. No EPDM roof can take the abuse a Modified Bitumen Torch Down roof does.